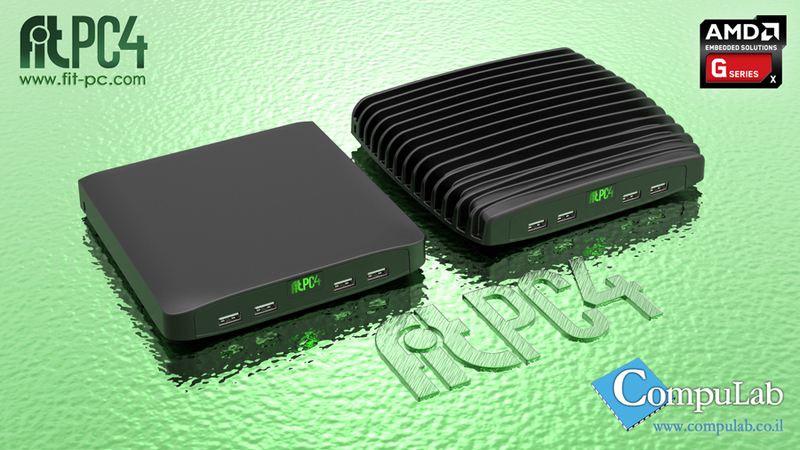 Yokneam, Israel – 25-Feb-2014 – CompuLab is introducing fit-PC4 – a miniature fanless PC based on AMD’s next generation G-Series “Jaguar” SoC. Powered by the 2 GHz quad-core AMD GX-420CA, fit-PC4 scores over 5000 in Geekbench 2 – over 3 times the score of fit-PC3. fit-PC4 provides ideal networking in any scenario with dual Gbit Ethernet based on Intel i211 Ethernet controllers, 802.11ac WiFi and on-board uSIM for cellular data communication. The integrated AMD Radeon HD 8400E coupled with dual HDMI with CEC support and S/PDIF 7.1 audio provides excellent multimedia experience in both Linux and Windows. Rich connectivity, high memory capacity, flexible storage options and expandability – make fit-PC4 an extremely user friendly system. fit-PC4 builds upon the proven reliability of fit-PC3, sharing the same ruggedized fanless design and is provided with 5 year warranty. fit-PC4 is available now starting at $299 for the Value-Barebone model or $380 for the Pro-Barebone model.